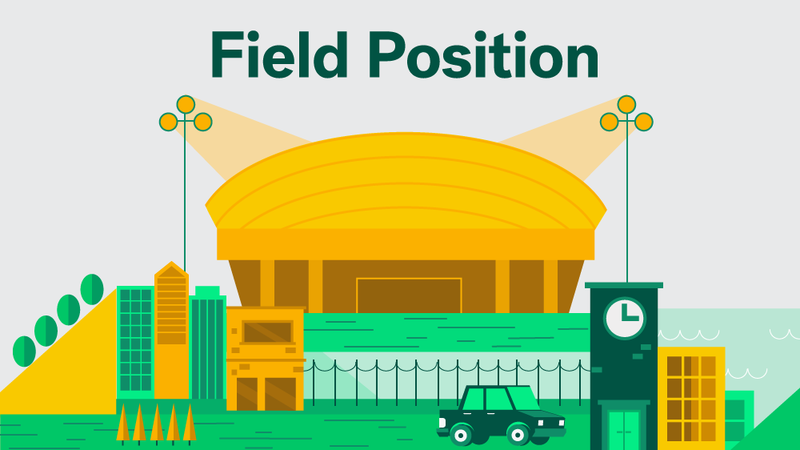 Field Position: Does An NFL Stadium Boost Your Home Value? Pro football’s return to Los Angeles hinges on a new stadium project that promises to enhance the economy and property values of the region. Call it a different kind of “red zone.” Neighborhoods around National Football League stadiums tend to have homes that are more expensive both in sales and rental value, but new stadiums built in the last decade, by and large, have failed to lift the fortunes of homes in nearby areas. In other words, owning a home near a stadium is nice, but if they build one down the street, don’t get your hopes up. The impact of NFL stadiums on surrounding areas is a timely issue given that the Super Bowl will be played Feb. 7 in the new Levi’s Stadium – a venue sought after in the Bay Area and eventually built in Santa Clara, Calif., – and the protracted fight over the league’s return to Los Angeles after a 20-year absence. Last week, NFL owners voted 30-2 to return the Rams franchise to the Los Angeles area, specifically, a site in Inglewood, Calif.
Of the 31 neighborhoods around the nation’s pro football stadiums, nearly two thirds have higher housing values, on average, than houses in non-stadium neighborhoods. Inglewood, Calif., the planned new home for the Rams has home values that lag the region by 8.9%. A proposed site in Carson, Calif., has slightly higher home values, on average (1.8%), than other homes in the Los Angeles market. The neighborhood surrounding the former Rams’ home, the Edward Jones Dome, potentially has a lot to lose: homes within two miles of the dome are worth 16.7% more than homes in the St. Louis area on average. 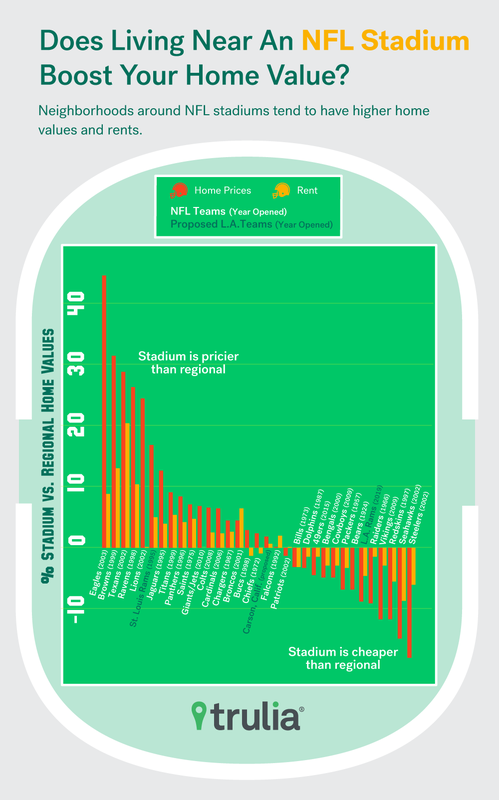 During the last 10 years, five new pro football stadiums have opened and none, so far, has had a noticeable impact in raising home values in its immediate vicinity (a two mile radius). Near Dallas, prices around AT&T stadium have lost value compared to the greater Arlington, Texas, area since that venue opened in 2009. Prices of homes near Lucas Oil Stadium have failed to keep pace with the greater Indianapolis market since the venue opened in August 2008. City officials in St. Louis, citing the value of the franchise to the community, offered more than $400 million in taxpayer money to build a new $1.1 billion stadium and keep the team. Inglewood officials are also offering tax breaks for a $2.2 billion project that may include new residential construction. Home values and rents near the Edward Jones Dome are 16.7% and 5.1% higher, respectively, than homes in the St. Louis metro area on average, according to our study. Though every stadium has its own unique characteristics – MetLife Stadium, for instance, is located in the sparsely populated Meadowlands region of East Rutherford, N.J., while Heinz Field is in downtown Pittsburgh – studies have shown that these structures have a significant economic impact on their neighbors including residential real estate. What our research, like other previous studies, suggests is that the impact, if any, is inconclusive and/or the neighborhood surrounding the stadium, rather than the stadium itself, is the determining factor. For instance, buyers and renters pay a premium to live near some stadiums including Lincoln Field, home to the Philadelphia Eagles, and First Energy Stadium, home the Cleveland Browns. A buyer should expect to pay 44.3% more than they would for an average Philly home, or 31.2% more for an average Cleveland home. Likewise, rents are 8.9% and 12.9% higher respectively. Contrast those premiums with home values and rents near CenturyLink Field, where the Seattle Seahawks play and Heinz Field where the Pittsburgh Steelers play. Homes are 14.7% less and rents 8.7% lower within a couple miles of the Seattle stadium, home values 18.0% less and rents 5.9% less near Heinz Field than comparable homes in those cities. Rams owner Stan Kroenke has pitched the Inglewood stadium as more than just a football venue. The site will be developed with movie theaters, shopping and with a residential component. It will also house league offices and play host to TV and digital production for the NFL. Green-Murray said Inglewood has been a hot market as of late. 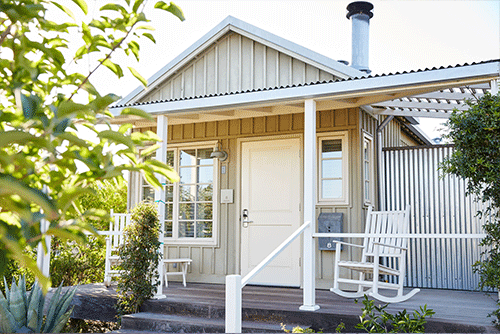 Inventory is low and homes don’t stay on the market long. Inglewood still lags greater LA for average home prices. 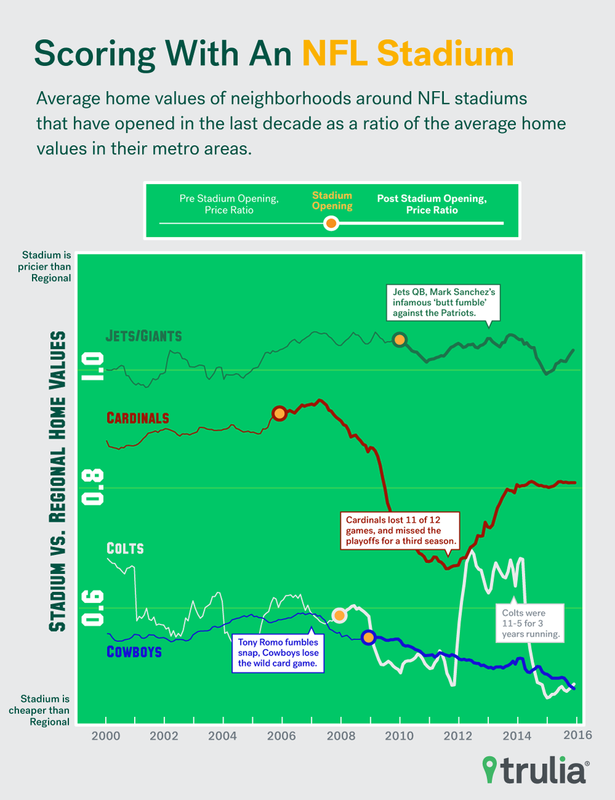 To determine whether homes near NFL stadiums are worth more or less than other homes in a metro area, we estimated a hedonic model to determine the effect of being within two miles of a stadium on a home’s value while controlling for the number of bedrooms, number of bathrooms, square feet, lot size, age, and zip code of each property. This allowed us to estimate the percentage value difference for properties near stadiums compared to properties further away. We used a 10% level for statistical significance, and employed a 5% trimmed sample to reduce the effects of outliers on the regression estimates. Only metros where the coefficient on being within two miles from a stadium was significant were considered as having an effect. Among the 31 U.S. metros with NFL teams that we examined (the Giants and Jets share a stadium in New Jersey), all but one made the cut. Also, we excluded Levi Stadium in Santa Clara, Calif., since it just opened in 2015. 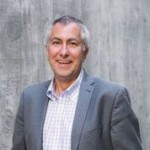 David is the managing editor for Trulia's Housing Economics Research Team. 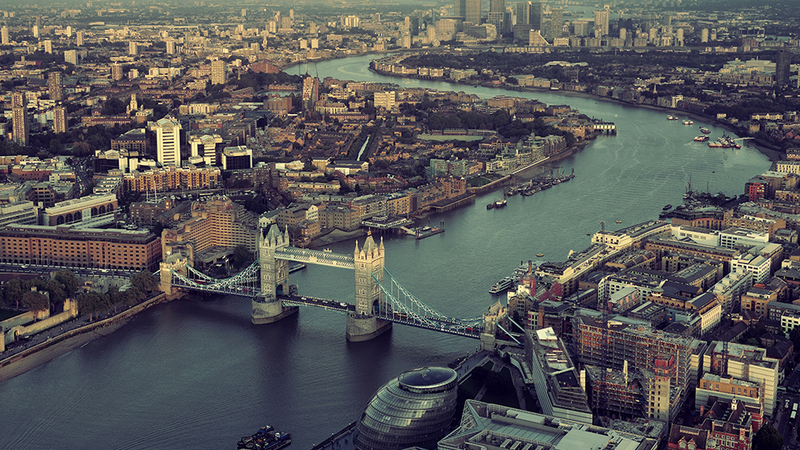 Britain's decision to leave the European Union shouldn't affect home buying and selling in the short term – but keep an eye on the global economy. 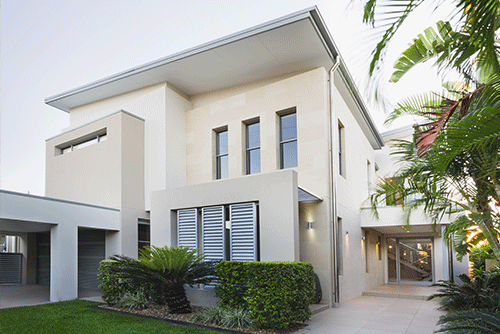 Rents in the nation’s 25 biggest rental markets have fallen slightly in the last year. But many metro areas, especially Oakland, Orange County, Calif., and Phoenix, are seeing affordable listings disappear. 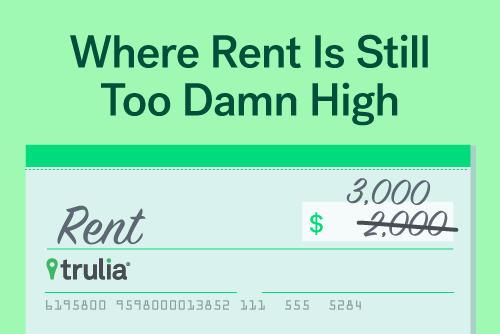 Meanwhile, Miami, New York, and San Francisco are still home to the nation’s least-affordable rental markets with sky-high rents. New homes are helping homebuyers constrained by low resale inventory, but there's room for more. Single-family grows strong, multifamily growth sputters, and new work from our team suggests delays in building approval is holding back supply.